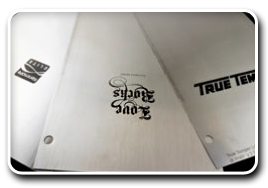 Printex offers state-of the-art thin steel plates in .50 mm (.25 mm is available by special order only). These plates feature high Rockwell hardness in the 50 range rivaling the old style, thicker metal plates. Offering superior graphics reproduction and optional screened artwork, the Printex thin metal plates bring real value to our customers with much lower price advantage over thick metal plates and availability in various sizes. Contact our technical or customer service departments for a review of your application.